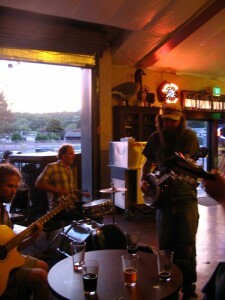 BrewGrass every Thursday Night from 6-9pm at the Mount Shasta Brewing Company located at 360 College Ave. in WEED, Ca. (right off I-5 ) This is a great way to unwind after a long Thursday hard at work. Banjo Billy is the founder of this jam, an amazing musician, who moved out here from the little old country town of Montevallo in Alabama!! He’s got all kinds of good stories, and roosters for sale!! Last fall Billy represented Northern California in the statewide talent contest through the Grange Hall. Billy Shaver is a bluegrass picking man and he doesn’t limit his style strictly to bluegrass he also performs just about any request anyone might have! If he doesn’t know the whole song, I bet he’ll know the chorus!! Or if your’e ready to sing he’ll fake the instrumental so well you’ll think he has played it a million times!! BrewGrass night has been pulling in amazingly talented people from all over the region! Thursdays are an open jam to everyone, but please remember it is a heavily bluegrass, country influenced sound so please keep that in mind if you plan on playing. So come on down to our Mt. Shasta Brewing Co. and have some award winning beer and award winning music!!! By the way it’s fun for the WHOLE FAMILY!! !